We invite you to join us for a day of amazing music that’s been long in the making. 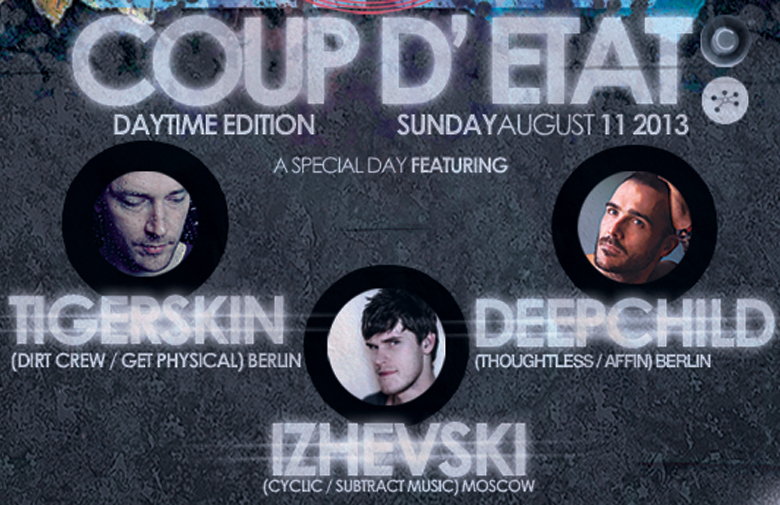 Tigerskin makes his long awaited return to LA, along with the debut of Deepchild, who who hardly needs an introduction. Fellow Berliners are joined by Moscow’s own Izhevski, having just released a great atmospheric remix on Subtract Music. Anton Tumas and SAND are on the support duties. We also just obtained a Special Guest, so stay tuned for that announcement! It doesn’t happen too often that this level of talent comes together, artists that let their music do all the talking! Can you think of a better way to celebrate the end of an epic summer, than by listening to amazing music in a cozy outdoor setting?!? Conveniently located in the heart of Hollywood, La Vida’s open-air courtyard will be transformed by us with a banging sound system that will blow your socks off…just for one day!